Sunsilk Perfect Straight : Review - A Rose Is A Rose Is A Rose! I have shoulder length hair as seen in the profile pic on this blog. As you can see, the hair are neither straight nor curly but wavy and these hair have a mind of their own. They curl and twirl in any direction and if not tamed well and timely, they have the power to scare a small child! OK, the last part is an exaggeration, but you get what I mean. Now straight hair stays in perfect shape even as it dries! This product seemed like a dream come true for my hair. I wanted to try this shampoo and conditioner to tame my unruly hair. I washed my hair with Sunsilk Perfect Straight Shampoo and then used the Perfect Straight Conditioner. Waited patiently as the hair dried. Both the packs said “Keeps hair fully aligned as it dries”. The hair dried after a while and the result… I didn’t see any noticeable change and my hair had the same wavy look. I was not disheartened, I thought, may be with regular use, I would see the change. Also, I read on Facebook somebody mentioned that her hair remained straight for 2 days with this shampoo. Motivated by this, next day, I oiled my hair and then washed with the duo. I had to use a larger quantity to remove the traces of oil. I read the instructions on the conditioner pack, to see if I was doing it wrong, but no, there weren’t any special instructions, just the regular ones. The result… the hair smelt good, had a soft and smooth feel but did it give me that perfect straight look? The answer is NO! I had the same wavy hair as before! Used the shampoo and conditioner pair for the third time, and then the fourth and then the fifth… The results with my hair were not what the packaging or the advertisements claimed. Though I am disappointed but I believe this product is not designed for wavy hair. May be it is for people who have straight hair and/ or with slight curls. I don’t know, if using the Serum for the same would help. 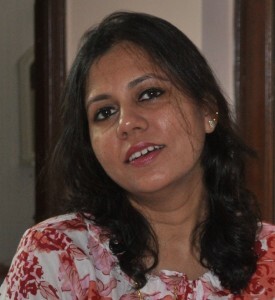 This post is a part IndiBlogger‘s review program for Sunsilk Perfect Straight Contest. My point is if the product is meant to straighten the already straight hair what is the sense? And shud that not be written on the product? Not fair!!! I strongly feeel that companies get into loads of markting gimmicks to make their product different but hardly deliver what they commit. Thansk for an honest review! I know what you mean DC. They say the pioneering Straight-Lock Technology in Sunsilk Perfect Straight harnesses the power of amino silicone; an adhesive ingredient and mineral oils, locking in that magic moment for perfect shape!! Sorry, but the pioneering technology didnt work on my hair. But I have seen some very positive reviews on the product too! I think all these are gimmicks of the companies to sell more products. They just change the colour of the bottles and the colour of the shampoo and voilà you have a new product. Yeah, marketing is king! While the food products like Complan, Boost, Horlicks, Kelloggs face prosecution for false claims in their advertising, I wonder the same would be applicable to beauty products! Shilpa, all these advertising with beautiful models are to lure us the consumers. I think most of us (hair and skin) are victims of today’s pollution and many of us consumers get trapped in these enticing ads. After all,these are chemicals and may not suit us. And just last month, another famous chain, the famous haircutter of the ex prez MR. J’s chain came home on a door to door campaign offering hair and skin cure for just rs750/ all through the year. I was tempted, but i finally held myself back. Some of my friends who enrolled are already complaining about the difference in customer service. Sometimes, i think we should let it be the way it is, It becomes our identity- Our skin and hair. Oh yes, there are so many products that make tall claims in their advertising campaign. Some time back, there was this news… In what could prove to be a major marketing and legal embarrassment for Hindustan Unilever Limited, a 26-year-old man has filed a case against the FMCG company, which owns the Axe brand of men grooming products, for ‘cheating’ and causing him ‘mental suffering’. The plaintiff has cited his failure to attract any girl at all even though he’s been using Axe products for over seven years now. Axe advertisements suggest that the products help men in instantly attracting women. LOL at the bai beating…… Really did he take that far? Did he win? any idea? I have wavy hair to. I agree wavy hair do have a mind of their own. But I quite love my waves. And rather than having inclination towards straight hair I crush on curls and hence never really thought of giving this shampoo a try. Thank you for your honest review. It again proves that all these declarations are nothing but marketing gimmicks. My hair is like yours, so I guess this won’t work for me either. Full marks for honesty. The problem is we are constantly bombarded with models who have straight hair, and we fall in to the trap, we feel only straight hair looks gorgeous. I also like my wavy, slightly curly, sometime straight hair, it has a mind of its own. However as long as it is healthy,shiny and soft I don’t let this straight hair look bother me. You know as they say, the grass always looks greener from the other side. We have people who have absolutely beautiful straight hair yearn for wavy and curly hair, and they go through the same chemically curled hair and regret later on. There was a time when curly hair was very popular, with everyone going and having it done in the parlor. And anyway, the artificially straightened hair looks like straw, and is dead. I am happy with my own hair and my own color. Now with short hair it doesn’t really matter what type of hair I have. Straight hair also tends to look very limp if it not thick, whereas wavy/ curly hair has that natural thickness and bounce, no need for any back combing. How much chemical such shampoos are loaded with, god only knows. I would ask you not to use it any more, for i am sure you will feel your hair becoming knotted and dry after many uses. Maybe you can use it once in a while and always use some serum and blow dry it. One should definitely not make it a habit to use it regularly. Your review was well written and frank. Happy to read another honest post.. I just posted mine and I have mentioned too that it dint give me the absolute perfect look that I was expecting..I would call it a little straight-effect. Thanks Manjulika!! Yeah, I read your review too, true, the product didnt live up to its claims! I don’t think anything can tame my hair. My hair is wavy – just like what you have mentioned! My hair too is wavy. I am more worried about the hair fall problem than the straight-wavy-curly look, though the I love bouncy curls (which I am sure am not going to get naturally). The anti hair loss, damage therapy shampoos/oils of various brands I have tried were disappointments. None proved to be what they promised. Same here, I am very happy with my L’Oréal Paris Total Repair 5! Shilpa, I am glad you shared your experience. I tend to experiment a lot with shampoos because my hair is all curls, unruly and i am infinitely in search of the dream shampoo that will help me have straight, silky hair. The search is still on…and in a way, I am glad i read this. I know not to buy that bottle. So you got the sunsilk product I am yet to get mine. I don’t have high hopes on this though. You have written your experience well. I am yet to get my gift hamper for the earlier Sunsilk contest! Have you received that?? Maybe it’s meant for artificially straightened hair ?? Hmm ! Mine is wavy too and none of the conditioners ever helped me straighten them a bit. I think this is all marketing strategy to fool people in buying their products. I don’t think any shampoo or conditioner can change the inherent quality of your hair. It is foolish to make such claims. But then Fair & Lovely has been successfully fooling people for years. I did not receive my sample though got two calls to ask whether I had received them. Good you gave it straight to them. Hello Ladies (and the few guys) ! Ok ! First up, I am a guy with short hair and I’m not really sure if the following stuff works for you, but it’s worth a try ! I have dry and brittle hair, which is frizzy and gives me unkempt look. I tried several things and settled finally with the below procedure. Genly massage your hair with Amla Oil first and then with coconut oil. Remember the sequence is important. Keep this overnight. Wash your hair in the morning with your regular shampoo twice, first time to remove excess oil, second time to give proper finish. Don’t use conditioner. Coconut oil did that already. Dry your hair with a blow drier (only fan without heat) or if you dont have that stand below your fan, stroking your hair gently. The key is to let hair dry out as much as possible. Considering you guys have longer hair, it will take 5-10 minutes. But don’t let them dry on their own. Use a Roller comb to do your hair. This is more important then it seems. This is what I do, and the results are really worth it. I get smooth,bouncy and voluminous hair everytime I do this. Please let us all know if you tried it and it worked for you. ever try it!!!!! My money got wasted…. Thanks for sharing your experience, Rihan!